Over the years, people have pondered what a viable competitor to Steam’s dominance would look like. Who would pull it off? What would be their silver bullet, capable of hobbling even Valve’s game-slinging behemoth? 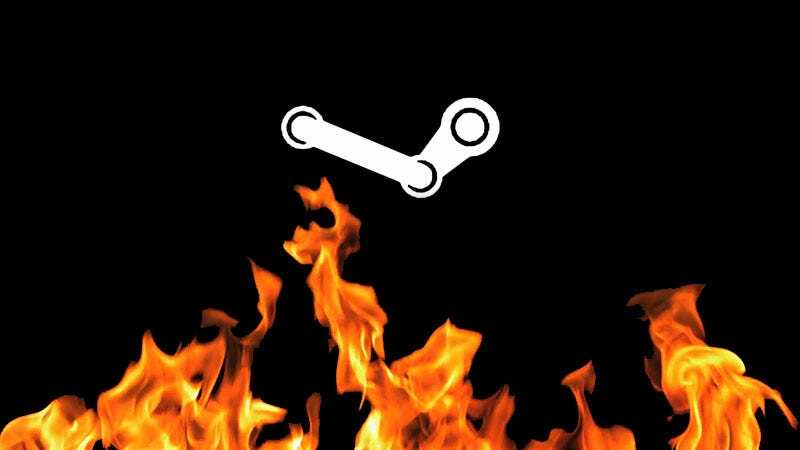 Late last week, Valve announced that Steam will take a lesser cut of revenues from games that sell $10 and $50 million worth of copies—25 percent for the former and 20 percent for the latter. Today, everyone emitted a collective “ohhhh, now I get it” upon finding out why: Unreal Engine creator and Fortnite developer Epic announced that it’s on the verge of launching its own store, one that’ll take a cut of just 12 percent of earnings from developers—way down from the industry-standard 70/30 split that Steam helped pioneer. Epic’s announcement puts more pressure on Valve, a company known for its tendency to only react out of absolute necessity, whether in regards to hate groups in Steam’s inconsistently policed community section, “fake games” taking advantage of an exploit in Steam’s trading card system, the normalization of review bombs as a viable tactic to try and tank games’ sales, or the Counter-Strike gambling ring. Steam never had all the biggest games on PC, what with League of Legends, World of Warcraft, Minecraft, and others occupying their own mammoth chunks of the internet. Valve compensated by opening up Steam to indies and, over the years, home-growing hits that ranged from Terraria to Stardew Valley to PUBG to Rust to Undertale. But the number of big-name absences has become more conspicuous in recent years. Two of this holiday season’s biggest games, Fallout 76 and Call of Duty: Black Ops 4, both eschewed series-typical Steam releases and came out on publisher-owned platforms instead. Fortnite continues to do numbers that rival Steam all by its lonesome, Overwatch is dominating the team shooter scene on Battle.net, and EA’s Origin continues to, er, exist, which means series like Battlefield have also departed Valve’s storefront. Other competitors, too, like the Discord store have popped up, though they haven’t made many waves so far. There’s now a blueprint out for publishers taking their 30 percent revenue cuts and going home, and more of them are starting to follow it. Valve doesn’t have one big competitor; rather, it’s surrounded by a bunch of fiefdoms that, simply by existing, call into question the necessity of publishing games on Steam at all. Smaller developers, meanwhile, are dissatisfied with a service that seems increasingly indifferent to their needs, leaving them to force their signal through the noise while surrounded by tools that an increasingly toxic community can game as they please. Many have wanted to jump ship, but there hasn’t been anywhere else to go. That feeling of helplessness has only bred further resentment as Valve has stubbornly stuck to its guns. If they’re not careful (and sometimes, even if they are), developers can find themselves up to their necks in a quicksand of community toxicity, sagging sales, race-to-the-bottom pricing, and Valve’s notorious hands-off approach, which frequently exacerbates these issues. Despite all that, Steam is still massive, and through everything from deals to front page carousels to discovery algorithms, Valve has tried to give developers more ways to surface and resurface their games. Getting games up on the store has become a relatively straightforward process given how many eyeballs they stand to be seen by, so in terms of bang for potential buck, Steam remains tough to beat—even with smaller, more developer-focused stores like Itch.io in the mix. Steam can still be a hit-maker—as demonstrated by recent success stories like Raft, Slay The Spire, and They Are Billions—albeit one that makes improbable underdog magic happen on an increasingly rare basis. But Steam is also cluttered with features and games, the product of years of problem-solving through addition rather than streamlined subtraction, and the diehard portion of its user base that’s often responsible for elevating games to a place of visibility has relatively homogenized tastes, making the environment inhospitable (or even downright hostile) to games that want to explore, for example, marginalized identities, status-quo-defying politics, or even just non-traditional mechanics. If they’re not careful (and sometimes, even if they are), developers can find themselves up to their necks in a quicksand of community toxicity, sagging sales, race-to-the-bottom pricing, and Valve’s notorious hands-off approach, which frequently exacerbates these issues. In the past, developers and publishers worked with Steam because Valve’s store offered guaranteed exposure—and hopefully, sales—to millions of users who weren’t going anywhere because they’d purchased so many other games on the service. These days, it’s not clear that getting on the platform leads to sufficient visibility, especially given how much potential trouble developers have to deal with in the process. Bigger games will, of course, rise to the top of the charts faster than others due to expensive marketing campaigns and things of the like, but even those games struggle to remain on top for long. Now Epic is trying to do Steam one better. A 70/30 split might not be appealing to developers and publishers anymore, but how about 88/12? On top of that, Epic is touting scale-tipping features Steam developers have been requesting for years like a built-in bug-reporting system, opt-in/out user reviews, and a lack of forums and other social media to mitigate Steam’s rampant toxicity issues. Developers, it sounds like, will be able to handle things more on their own terms. In addition, if developers decide to use Epic’s Unreal Engine 4 to make their games, they don’t have to pay additional royalties to Epic—a proposition likely appealing to smaller developers already burned by Steam’s new make-the-rich-richer approach. Contrary to popular belief, competition between behemoths is not always good. While it’s theoretically better than a virtual monopoly, it can lead to exclusives, a lack of online play between versions of the same game, and other decisions that ultimately hurt people stuck in the middle. The fact that Epic’s first salvo seems to have caused Steam to go all-in on big publishers at the cost of already incensed indies lends credence to that. Still, there’s a lot to like about Epic’s approach, and with Steam clearly feeling the heat, maybe Valve will finally fix a platform it can no longer afford to leave broken. And if not, perhaps the company will finally suffer some real consequences for its prolonged inaction.